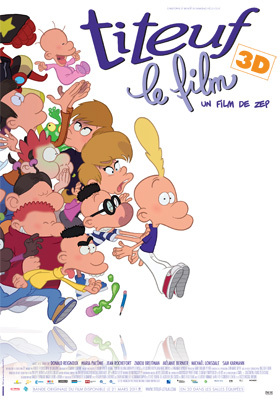 "Titeuf - le film 3D" is a French animated film coming to French theaters April 4th. A coproduction between Pathé, Moonscoop, Point Prod, and France 3 Cinéma, the film follows the adventures of Titeuf, a popular French cartoon character. Titeuf was born as a comic by Zep, quickly rising to become one of the most read comics in France, then adapted into an animated TV show, and now into a feature-length film. American audiences will likely not get to see this one, as the character's series has never been broadcast in the States. While you may be tempted to think this is the first stereoscopic hand-drawn animated film, there have been several produced sporadically in the past. Check after the jump for a short list of the theatrically-released hand-drawn animated films. this short along with Captain EO were what showed me, as a youth, the wonder beyond anaglyph.